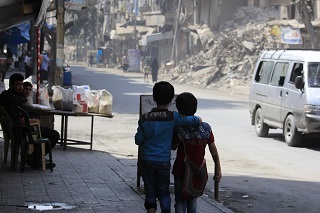 Two boys walk down a destroyed road in Aleppo. NEW YORK, 29 September 2016 – “In Aleppo, 96 children killed and 223 children injured in merciless attacks this week alone. Each one, a daughter or a son. “Doctors forced to let some children die while saving others with scarce medical supplies. “Tens of thousands of children drinking dirty water because a pumping station was bombed and another switched off. “Brave aid and rescue workers killed. “The world is watching these horrors unfold. Every day, they continue … and get worse. “The murder of the innocents in Aleppo must stop. “UNICEF and our partners have just delivered some supplies to the besieged areas of Madaya, Fouah, Kefraya and Zabadani. In addition to continuing operations in western Aleppo, we are doing what we can to provide trucked water supplies throughout the city. “But it is far from enough.